Formerly a shooting lodge, Redmire has a long tradition of good food and a warm Yorkshire welcome and provides comfortable en-suite farmhouse accommodation midst glorious walking country. Redmire is a family run traditional working hill farm set in 1,600 acres of stunning woodland, moorland and farmed parkland midst glorious walking country the heart of the Yorkshire Dales.The farmhouse enjoys a perfect secluded situation five minutes walk from the picturesque village of Buckden with panoramic views of Buckden Pike and Wharfedale which is said to be the most beautiful of all The Yorkshire Dales. Formerly a shooting lodge, now sensitively restored retaining its charming authentic interior with three very comfortable fully en-suite guest bedrooms and a cosy guests sitting room -which is accessible all day. Central to the Dales and open all year except for Christmas, Redmire offers Guests a very convenient base from which to tour the surrounding dales with their limestone villages and historic market towns. Home reared meat, which is available for guests to take home, locally inspired fare and wholesome breakfasts help to make. 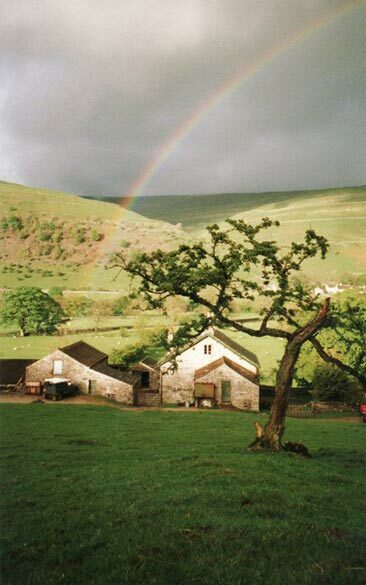 "Redmire a unique place to experience the life work and tradition of The Dales." There are places to eat locally, at Cray, and in Buckden, five minutes walk away. (Bring a torch - we have no streetlights: but people are always amazed at our starry skies). There are also very pleasant Inns serving good food and "real ale" at the neighbouring villages of Cray, Starbotton and Hubberholm - a lovely summer evenings riverside walk away. - and all within 1 1/2 miles of the farm. View from the twin room window of Buckden Pike.